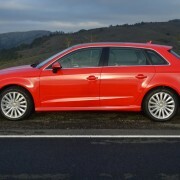 Audi’s bread and butter car is the A3, which is available in a stupefying number of iterations. 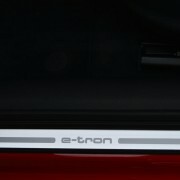 The newest and greenest of the bunch is the Hybrid “e-tron” version which debuted as a prototype almost 3 years ago at the Frankfurt Auto Show, reappeared at the Los Angeles Auto Show in 2013, and is now finally in production. The Hybrid offers two modes of propulsion. 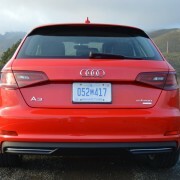 The first is a small displacement (1.4 liter) inline 4 making 148hp and 184lb.-ft. of torque. This advanced design engine features double overhead cams and 16 valves. The second motor is electric and produces 55hp and 243lb.-ft. of torque. 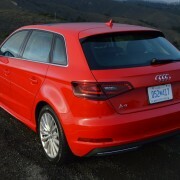 These engines feed their combined output of 201hp and 258lb.-ft. of torque to a 6-speed twin clutch automatic gearbox. 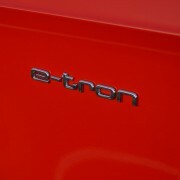 The e-tron model is offered as a five door hatchback, with comfortable seating for 4 adults plus a spacious storage area behind the rear seats. 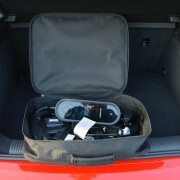 Fold those 60/40 split back seats down, and you’ve got enough storage for a mountain bike. 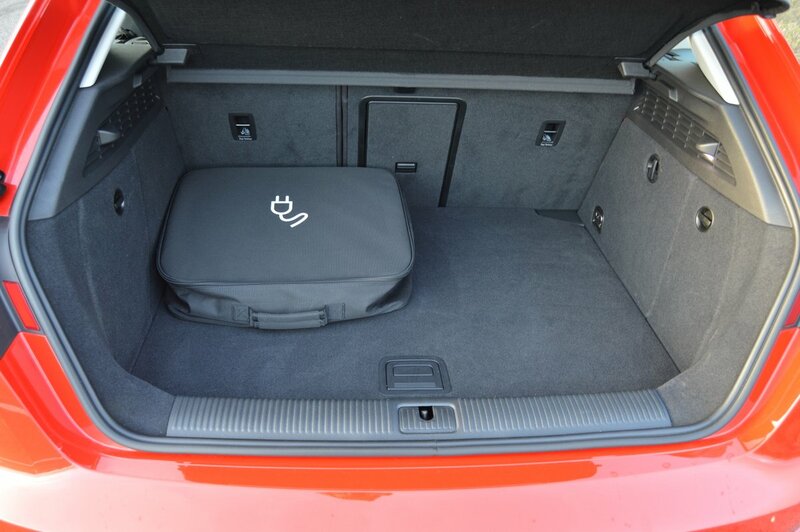 Inside the trunk you will discover a large zippered bag containing the recharge apparatus for the electric motor’s 661 pound battery pack. 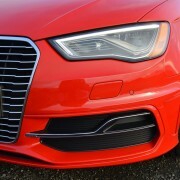 This kit consists of a heavy oblong charging unit which plugs into a receptacle hidden behind the Audi rings in the front grill. Included in the kit are alternate plugs for 120volt and 240volt applications. A guide light implanted in the grill throbs green as the unit recharges the battery, then turns solid green when the procedure is complete. At 120volts, a full charge on an empty battery takes about nine hours. At 240volts, the same process takes about three hours. 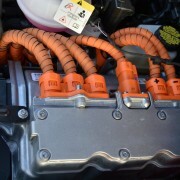 We left the charge unit fastened overnight in order to insure a full charge at 120volts. We then headed over the hill from our home on the coast to a point just 10 miles away. At that point the battery charge indicator read empty. 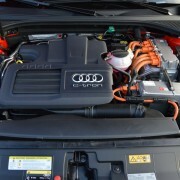 Audi estimates 33 miles per full charge, but does add a disclaimer that your charge mileage may vary. 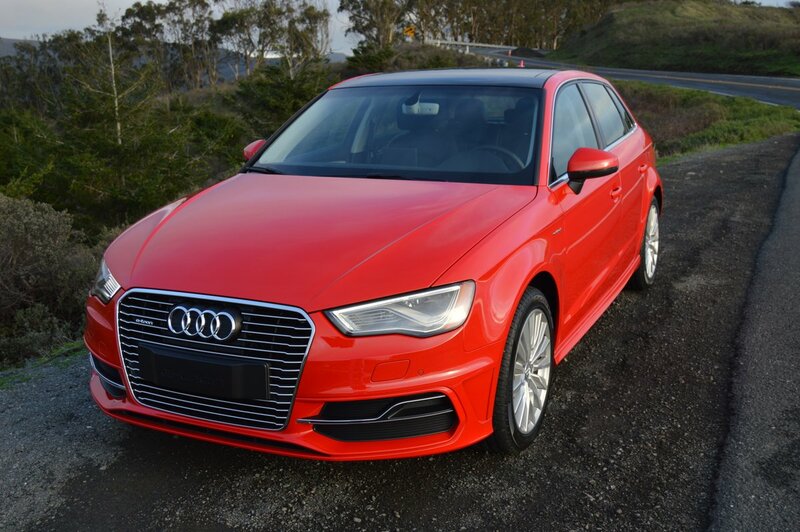 Regardless of such limited battery utility, the A3 Sportback is a still delectable German hatchback that provides stunning good looks allied to excellent handling. 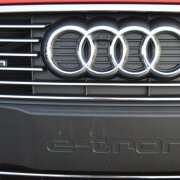 Although Audi has staked its reputation on the virtue of Quattro all-wheel-drive, the power train layout of the e-tron does not allow room to install all-wheel-drive in the Sportback. Thus, you must make do with front-wheel-drive only. 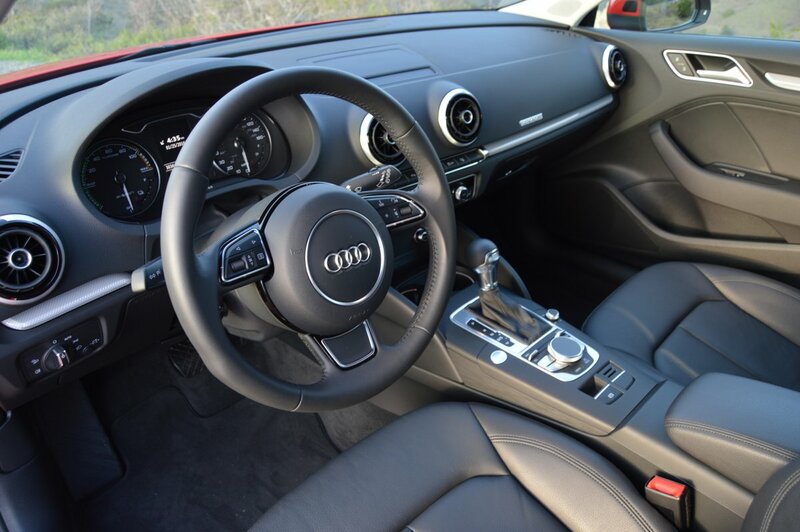 However, the traction offered by front wheel pulling power is excellent, so good in fact that you’ll be hard pressed to determine that the rear wheels are not also driven. 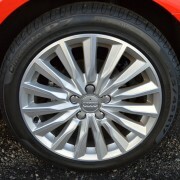 Helping control the A3 through turns and switchbacks are a set of grippy 225/45R17 Pirelli Cinturato P7 tires mounted on special 15 spoke “Turbine Design” alloy rims. 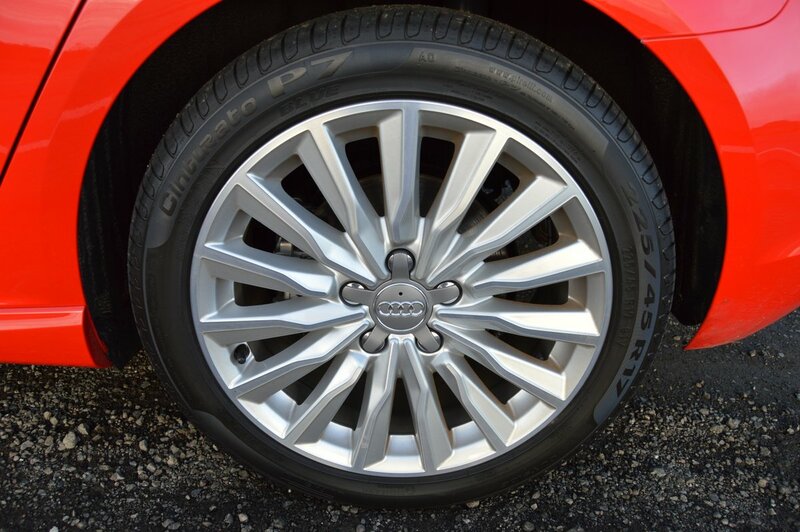 These tires and wheels are part of the optional $4,100 Premium Plus group which also provides heated front seats and full LED headlights. 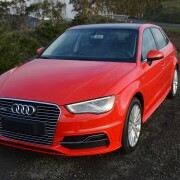 The fit and finish of the A3 has been improved over the years to the point that it is now indistinguishable from Audi models costing twice as much as our $46,655 test car. 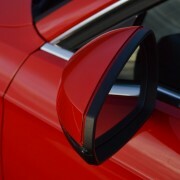 For example, the sport model front seats are works of art in terms of design, appearance and comfort. 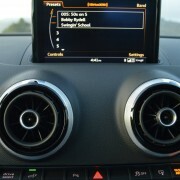 The dashboard features “3-D Optic” inlays which give this normally boring expanse of vinyl an alluring depth. High gloss aluminum window trim frames the side glass with handsome slashes of brilliance, while adaptive lighting in the cockpit casts a touch of Hollywood glamour on the entry and exit procedure. 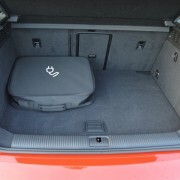 The dash and window treatment, along with the stage lights are all part of the Premium Plus package. 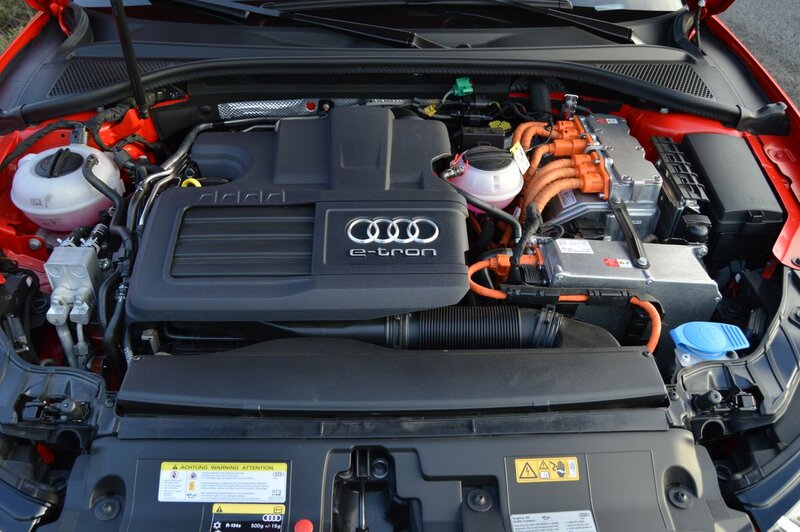 If your obligation to save the planet requires ownership of a Hybrid, the Audi A3 e-tron is a worthy choice. 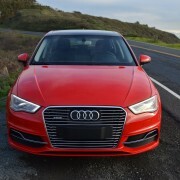 Unlike so many awkward looking electric powered offerings (Toyota Prius, Mitsubishi i-MiEV and Nissan Leaf come to mind), Audi’s petite Hybrid makes no concessions to ugliness. While it is not 100 percent electric, it still qualifies you as a certified greenie – without having to look like a weenie. 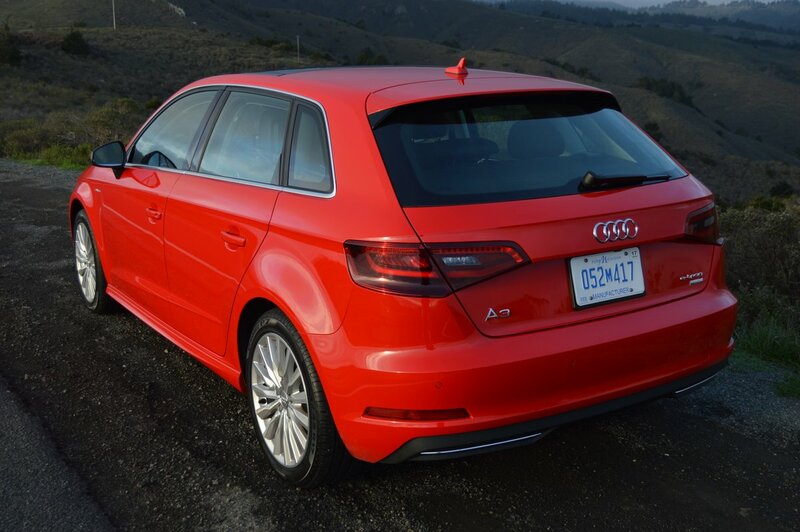 Indeed, the A3 enjoys all the attributes of its gas powered model line siblings: pleasing appearance, smart packaging, efficient use of energy sources, and unexpected comfort. 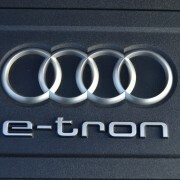 Although the base price of the A3 e-tron looks steep at $37,900, this entry level foothold on Mount Audi is well worth your investment.